As promised, I am sharing my more rustic Christmas mantel. I normally don’t post on Sundays but there are some HUGE things coming up next week (seriously, come back tomorrow** and check out the awesomeness!) and so I didn’t want to delay getting this post out. 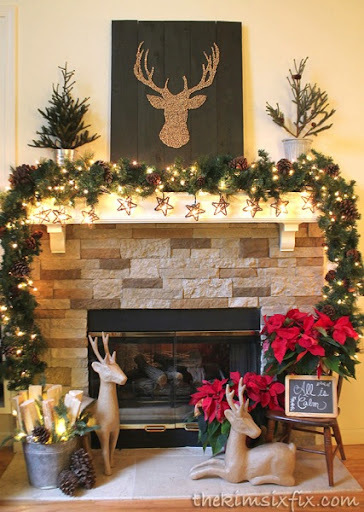 I already shared my wood slide deer’s head silhouette, and surprisingly that wasn’t the inspiration for this mantel. I actually had everything else set up and decided to whip that pallet artwork up at the last minute. The true inspiration were those cute little paper mache reindeer I got last year on clearance after Christmas along with my new stacked stone look of the fireplace itself. In fact, in the daylight I actually like the entire mantel NOT illuminated since it feels more ‘woodsy’: And night I do like the glow of the lights and the pretty shadows it cast. It turns out, this is another one of my favorite mantels.. and after some questions on how I get my garlands to look the way they do (and some Facebook feedback) I promise to put up a another tutorial on garlands sometime this week. **Don’t forget to come back tomorrow! I have a couple of HUGE giveaways (including a custom designed gift basket of my favorite things.. and a Silhouette Cameo!) It isn’t too be missed!